Posted June 1, 2010 in Genre, Superhero. The One Man Army starts his battle against “The Ocean Stealers” in the 18-page story in this issue. Sent by the Global Peace Agency to investigate a lake which has suddenly lost its water, we open with some great images of Kirby’s vision of a lake bed full of exposed and crushed plant and animal life. Finding an odd cube in the middle of the lake, he finds it unnaturally heavy, and gets a power boost from Brother Eye to move it, but even that might not be enough. Next we meet the evil scientist responsible for all this, Doctor Skuba, a water-obsessed madman who has found a way to compress water into small bars, including one giant one which will absorb the Atlantic Ocean. When OMAC tracks down his lair Skuba recognizes the atomic manipulation that created OMAC being similar to his own science, and is able to use that similarity to restore OMAC to his Buddy Blank form. OMAC is a lot of goofy fun with wild ideas thrown out at every turn. 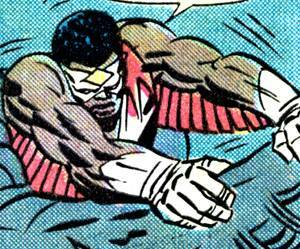 This adventure was obviously intended to be longer than the two issues it lasted, and I wonder if the connection between Skuba’s science and the technology used to create OMAC would have been explored. 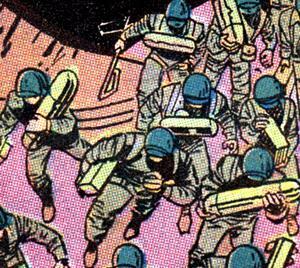 D. Bruce Berry inks the 18-page story and the Kirby cover, with mixed results. Several pages look really good, especially the 2-page spread, and any of the renderings of technology, but I don’t think he fully captures the right look on the faces all the time. Posted January 21, 2010 in Cover, Genre, Superhero. 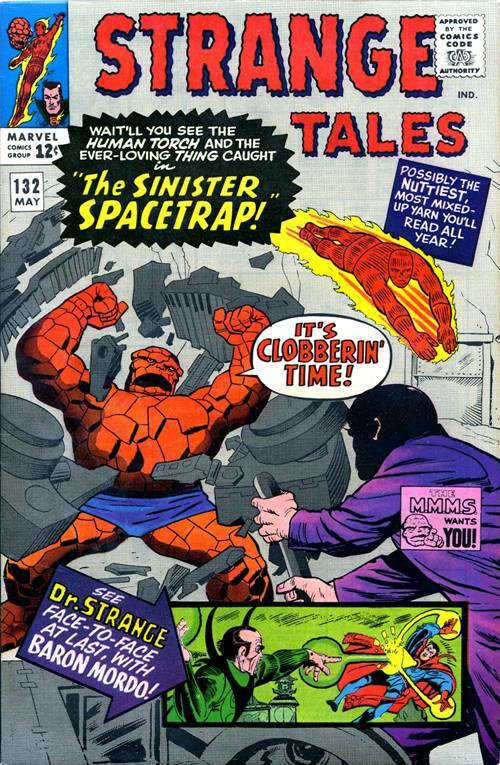 The Human Torch and the Thing get close to the end of their run in STRANGE TALES. Not one of the more exciting covers of the era, but interesting that less than three years after the Torch was given the solo spin-off from the Fantastic Four, here he was not only sharing his feature (and in this cover definitely playing second fiddle) to the Thing, it’s also the Thing who gets to be spokesman for the MMMS fan club. Wonder if they considered doing a Thing solo feature instead of Nick Fury for the book? Might have been interesting, if Kirby was doing full pencils for a good while at the beginning. Mike Esposito, who was briefly doing some work for Marvel as Mickey Demeo, inks the cover. Posted January 18, 2010 in Genre, Superhero. A change of pace visually in this issue of THOR as Bill Everett handles the inking on the interiors for a single issue, both the main story and the Tales of Asgard back-up (though a few pages seem to have some work by regular inker Vincent Colletta). Everett would come back for a longer run two years later. The 16-page “–And, Soon Shall Come: The Enchanters!”, to give the story its full over-punctuated title, opens up with the memorable scene of Thor sipping on a soda and attracting a large crowd of young admirers. 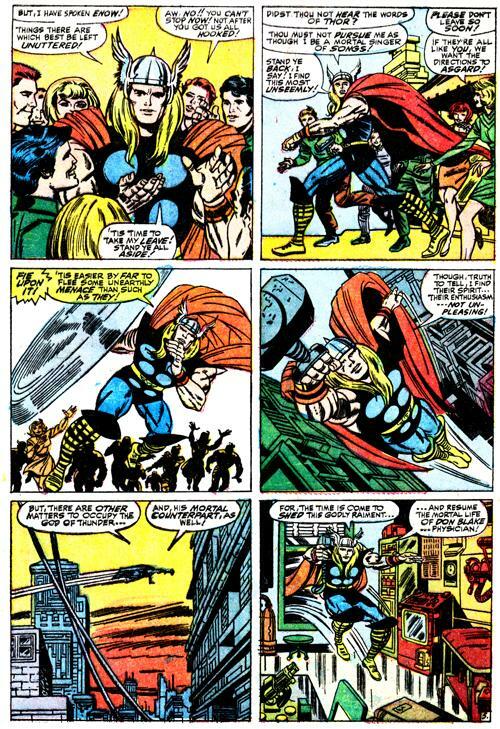 After explaining his lack of money for the drink and getting it comped (I’m sure the advertising value paid for it) Thor regales his fans with tales of the land of Asgard, allowing for a few pages of eye-candy before departing for some important business as Don Blake. The action quota for this issue is filled by Balder and Sif, who have been sent by Odin to Ringsfjord to assess the threat of the Three Enchanters. 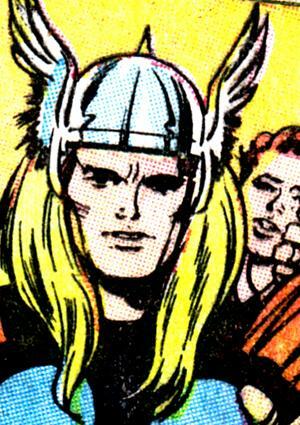 They find them, and they turn out to be decked outed in insanely elaborate Kirby costumes and ready to threaten Asgard. Balder and Sif are forced to retreat to Earth, and find Don Blake just as two of the Enchanters follow. A gorgeous looking story, with a several elaborate full page images. The “Thor at the soda fountain” thing is a cute and memorable visual, and a scene later where Balder and Sif are holding up traffic when they arrive in New York is nicely done. The Enchanters are largely throwaway villains, but remarkably well rendered in the two panels we see them clearly. The 5-page Tales of Asgard story “To The Death” continues the adventures of Thor and his compatriots in the Mystic Mountains, this time with most of the focus being on Volstagg, which means a lot of jokes about him being fat, cowardly and clumsy, but not letting any of that get in the way of his bragging. Volstagg is always good for a laugh, and Everett’s inks are even better in this story, a shame he only inked one of them. The cover is inked by Colletta, who would be back the next issue. Posted January 8, 2010 in Genre, Superhero. 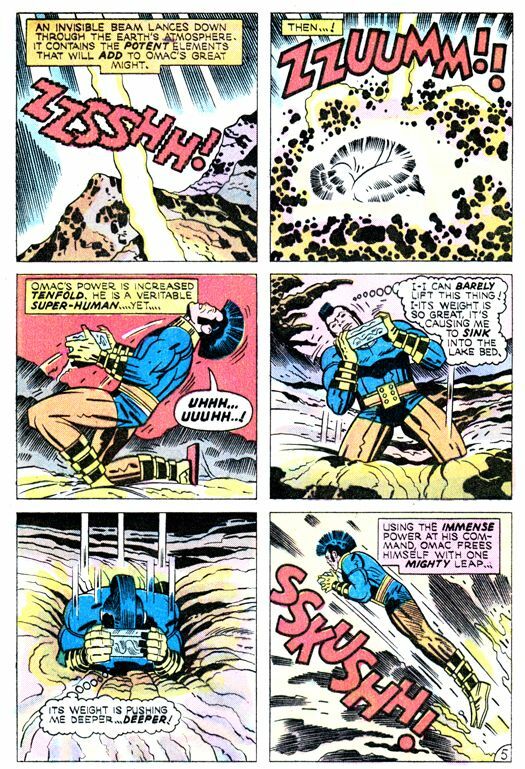 Kirby writes and draws the 17-page story in this issue, “Mad, Mad Dimension”, the middle of the “Night People” storyline. Cap’s search for the missing Falcon and Leila leads him to the boisterous Texas Jack Muldoon, who saw the Falcon disappear last issue. Muldoon’s been doing his own investigations, leading them to the missing “Zero Street” and the tale of a scientist who had a breakdown but continued his research into interdimensional travel from the asylum. Sam Wison has been brainwashed by the “Night People”, and at their bidding is battling a giant monster trying to attack the asylum, which is now located on top of an asteroid. He manages to knock the creature into space, but the Night People plan to open the gateway to Earth and send all the other monsters in the dimension to Earth. They open up the gateway and Cap leaps through, followed by Texas Jack. Kirby’s long final run on Cap is pretty fun. The Falcon’s fight with the monster in this issue is a nice bit of action, but the Cap side of the story is mostly getting characters in place for the big conclusion, and the phone call he has with Sharon Carter is kind of strange. Kirby also draws the cover, and both the cover and story are inked by Frank Giacoia. This whole story, and much more, is available in Captain America: Bicentennial Battles. Posted January 5, 2010 in Cover, Genre, Superhero. Here’s one of the covers being reprinted in one of Marvel’s new books this week. During this period, there would usually be three or four Marvel comics with just Kirby covers every month, in addition to the three new comics he drew. And a few Kirby reprints on top of that. 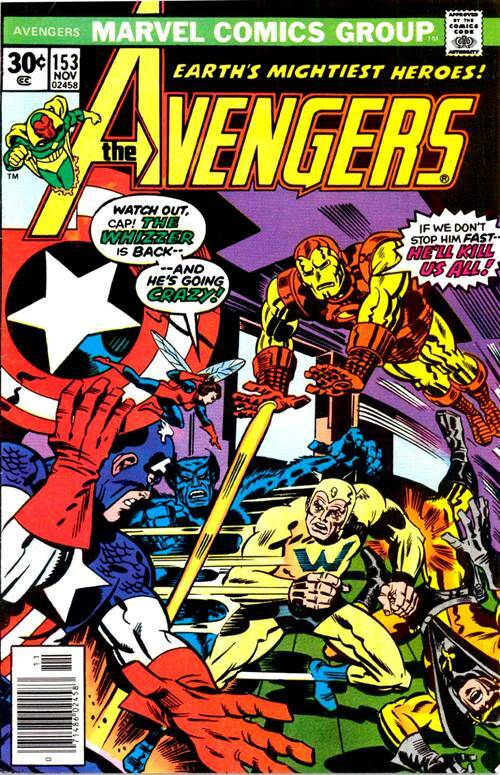 This one is inked by Al Milgrom, who does a really good job on the covers he inked in this period, sort of half-way between Royer and Sinnott, two of my favourite Kirby inkers. Would have been interesting to see him do a full story. Posted January 4, 2010 in Cover, Genre, Superhero. As I get back into the regular posting here, I’ll just re-introduce this particular feature that I started a while back. During his long career, Jack Kirby did the covers to well over 400 comics for which he didn’t do any interiors. And that’s not even counting reprints, which add over another 50 to the list. Hard to blame publishers for that, I’m sure Kirby covers sold. Anyway, I’ll eventually try to get all of those Kirby covers up on this weblog. In the 1960s, Kirby would keep doing the covers to many of the features he created long after handing off the interiors to others. 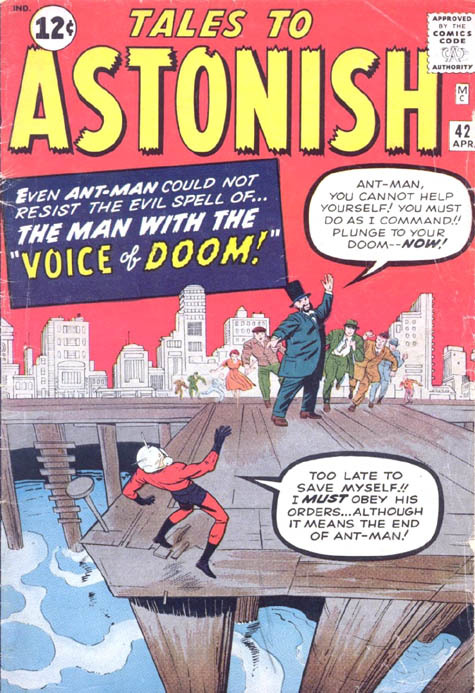 That was definitely the case with Giant-Man and the Wasp in TALES TO ASTONISH, which he had last drawn inside the book in #51. Marvel’s cross-over machine was in full swing by this point, with this month also including the Hulk appearing in SPIDER-MAN, the X-Men appearing in FANTASTIC FOUR, the Sub-Mariner in X-MEN and a villain named Zemo fighting both SGT. FURY and THE AVENGERS twenty years apart. Really nice Chic Stone inks on this cover, which has a pretty decent rendition of Spider-Man, although the swinging dynamic and the webbing are quite a departure from Ditko’s style. 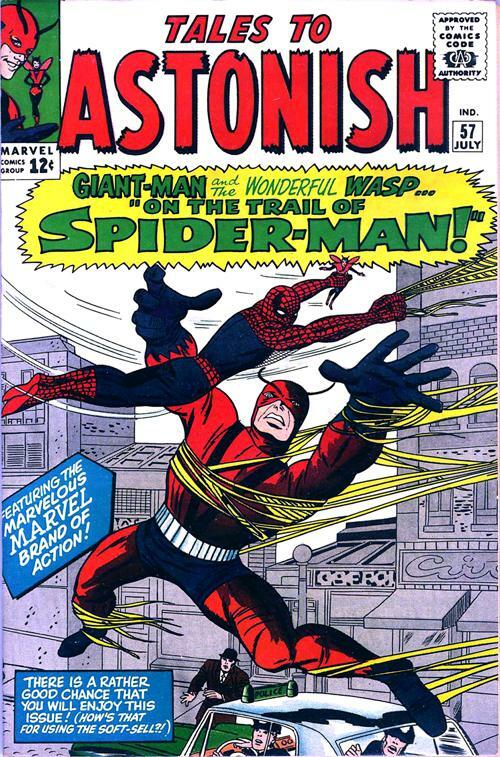 And boy, the Wasp really gets lost on these covers, which already have to be proportioned to emphasize Giant-Man’s size. Posted January 1, 2010 in Genre, Superhero. 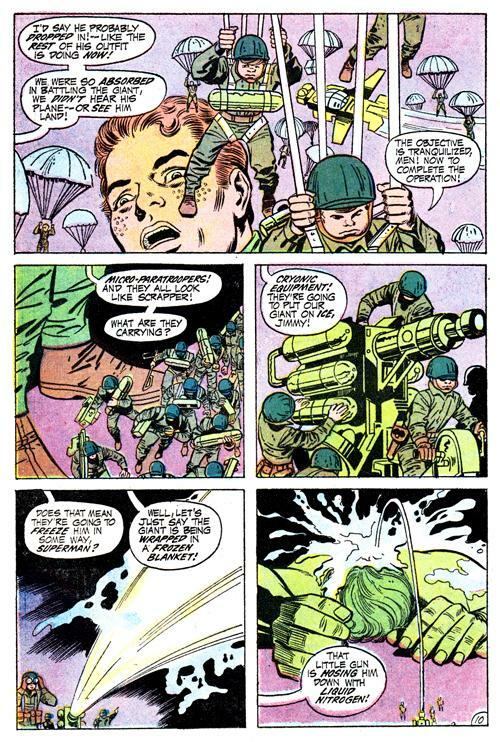 Jack Kirby’s fourth issue of JIMMY OLSEN features the 22-page story “The Saga of the D.N.Aliens”, opening with Superman continuing the fight with the green kryptonite-laced giant Jimmy Olsen clone, while the real Jimmy and the Newsboy Legion look on, and suddenly a new version of the Guardian, the old protector of the original Newsboys, joins the fight. The heroes aren’t doing too well, until suddenly rescue comes in the unexpected form of a the Scrapper Troopers, miniature duplicates of the feisty brawling Newsboy. Man, those guys at the Project were just goofy, weren’t they? Anyway, returning to the Project, the original Newsboys explain how a dying Jim Harper finally confessed to his identity as the Guardian, and they took a sample to create this new clone, and Superman shows Jimmy around the Project (some pal, keeping all this secret from Jimmy for so long), including the three types of clones, the Normals, the Step-ups and the Aliens, the latter demonstrated by Dubbilex. Meanwhile, in the Evil Factory, Darkseid’s minions Simyan and Mokkari get dressed down by their master for their inept handling of the situation, and hatch their next agent of destruction from their own out-of-control experiments. Kirby was really tossing out those ideas with reckless abandon in those early days at DC, even moreso than is normal for him. He even tosses in a collage to illustrate some of the science of DNA being used by the Project. Posted May 22, 2007 in Genre, Superhero. Decent little cover from the Ant-Man days, with Kirby playing around with some of the odd scales and perspectives that the feature called for. I liked the city in the background, too. Posted May 19, 2007 in Genre, Superhero. 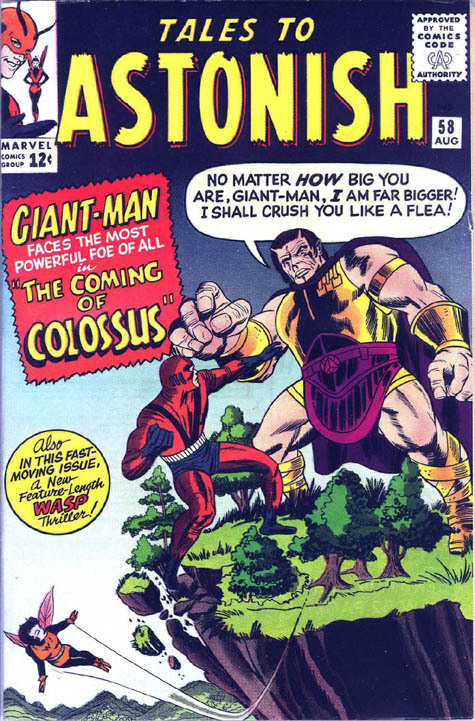 Jack Kirby and Sol Brodsky provide the cover to this issue of ASTONISH, another Giant-Man adventure. Great sense of scale on this one, and I always like Brodsky’s linework. Posted May 18, 2007 in Genre, Superhero. 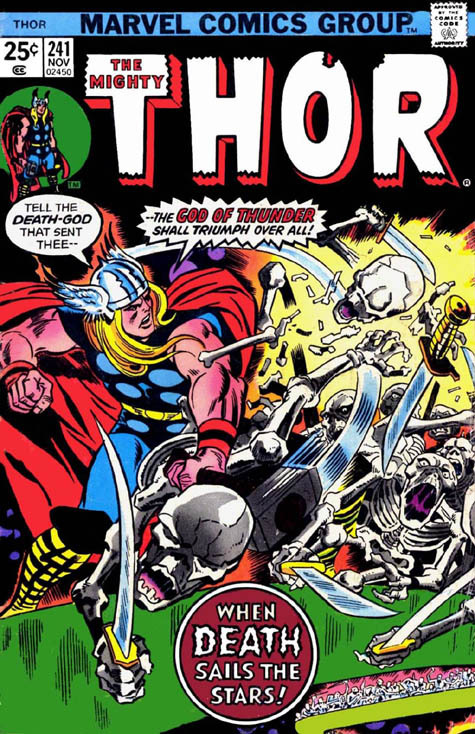 This cover was Kirby’s return to Thor after five years, and he definitely came back swinging, if you’ll pardon the pun. I wonder if he’d been watching some old Harryhausen movies prior to drawing this? Disagreement on sources as to the inker here. Kirby Checklist has Mike Esposito, and the GCD, via frequent commenter Nick, has Frank Giacoia. I’m leaning towards Giacoia. 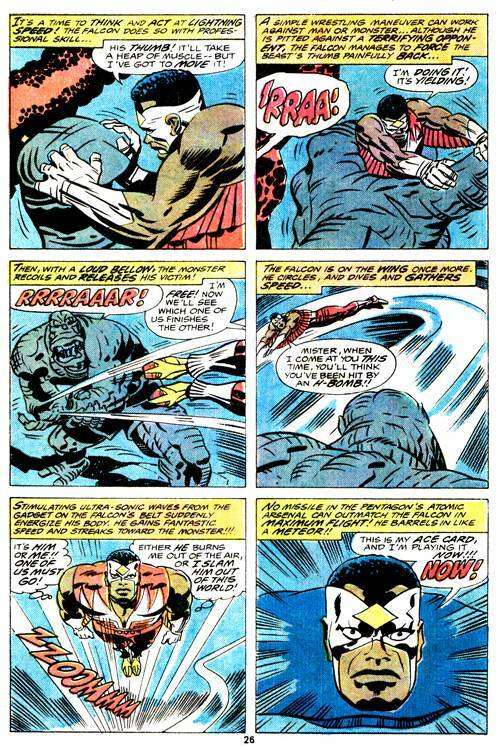 Are there any indisputable Esposito inks on 1970s Kirby to compare?